HOUSTON, Sept. 3, 2017 /PRNewswire/ -- LyondellBasell (NYSE: LYB), one of the world's largest plastics, chemicals and refining companies, today announced it has donated $25,000 in personal protective equipment (PPE) to the Houston Office of Emergency Management (OEM) to support emergency responders and recovery teams in their efforts to search flooded homes and businesses in the greater Houston area. The donated equipment includes 1,000 pairs of leather work gloves, 1,000 pairs of rubber boots of various sizes, 500 flashlights with batteries, 500 pairs of safety eyewear and 300 chemical suits. The donation of work gloves was generously provided by two of LyondellBasell's PPE vendors, Ringers Gloves and Ansell Gloves. "This is one small thing we can do for the first responders and recovery teams who are putting their lives on the line to save others," said LyondellBasell's Senior Manager of Global Security and Crisis Management Scott McHugh. "We have a strong partnership with the Houston OEM and we are glad we can provide support and cooperation during this time of crisis." 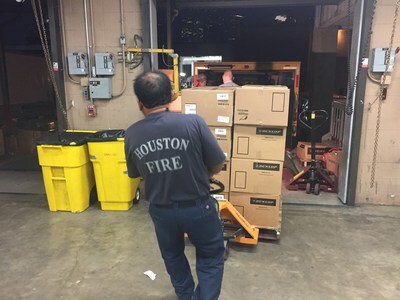 The protective equipment was delivered yesterday to the Houston OEM to ensure police, fire, emergency medical and recovery teams had enough PPE supplies for several more days of recovery searches of residences and businesses ahead of them. The donation will provide protection for more than 1,000 first responders as they continue their door-to-door recovery searches of properties in areas flooded from Hurricane Harvey.